Body Groomer… Yes, are you using one? If yes, then well and good else I ‘ll suggest you use one. I ‘ll tell you why. The time has gone when there was preconceived notion that only women use all kinds of beauty products, they will go to parlours, only they have to stay trimmed always. Now-a-days even men are pretty more conscious about it. Today, here We BestTrimmers team has brought to you the best hair groomers available in the market coz we hope you aren’t going to take risk of moving a razor all over your body for trimming all body hair. Then you are all set to get a well groomed and shaved look while protecting your skin with these body groomers. This BG2024/15 Body Groomer by Philips is one best option for you while choosing for the various range of body groomers available. This gives you a skin friendly and comfortable shave all though out the body at just one stroke. You can easily use this on hard to reach areas and also at underarms, chest & abs, back & shoulders, groin area and legs. It is waterproof and can be used in and out of the shower. The battery lasts for 50 mins after a continuous charge of 8 hours. The hypo-allergenic foil shaver and patented pearl tips prevent skin irritation, providing a reliably smooth body grooming experience. As it is very much handy it can be carried anywhere while travelling and also best part is can be charged even at the smallest spaces. You will get acharging stand along with the trimmer to charge it comfortably. You will get a 3 year warranty with this body groomer. Just apt for you to create your own style within minutes. This battery operated BG105/11 Body Groomer is another nice alternative from Philips. It seamlessly trims the body hair in both the direction. As it is non-rechargeable, so it works on one AA battery and you can use it continuously for around 45 mins. For a long time hairless look, you can attach the 3mm comb which has been specially developed for body hair trimming. The blades are way too sharp and doesnot need any replacement at regular intervals. It is very easy to clean and can be used in or out of the shower. Being quite handy it can be stored and carried anywhere while travelling. Not just this, you will also get a 2 year warranty period with this product. Philips Norelco Bg2040 Groomer is a Pro in body grooming ranges. 3D pivoting head allows the tip of the head, following the body’s contour being the ultimate for skin comfort. It is one of the high performance trimmers with round blades and combs to prevent scratching the skin. You can easily get the look you desire with the length settings. You can use it below the neck area, chest and abs, underarms, legs, groin area and back and shoulders without any discomfort. This body groomer is water resistant and hence you can use it in and out of the shower. Another best part about this hair groomer is, it has dual side design which lets you trim and shave with just one product. You can easily use it for around 50 mins after charging it for 8 hrs. With this you can trim , even your thickest hair without any cuts and nicks. 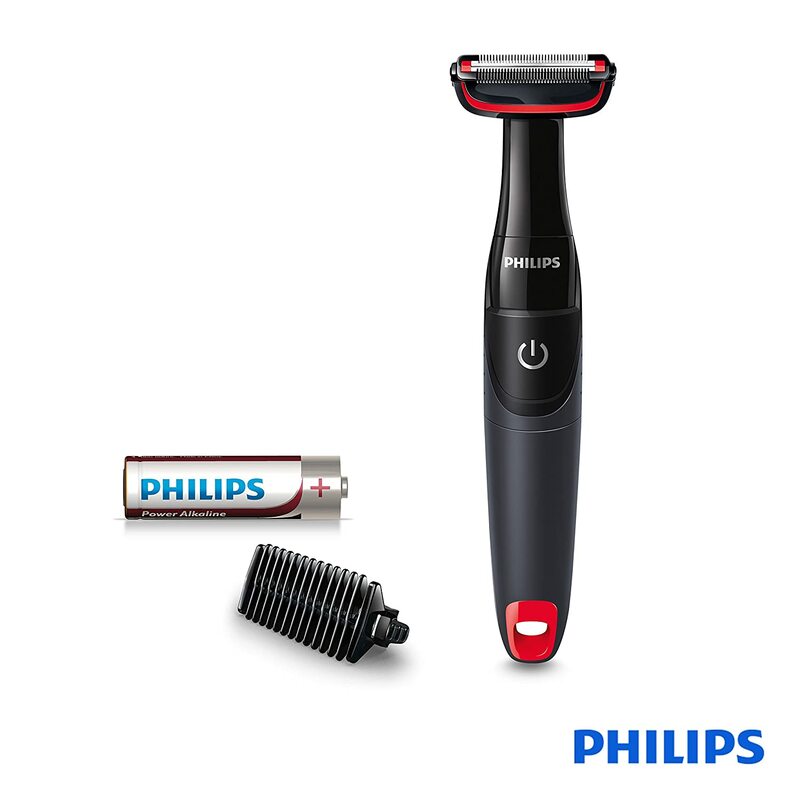 The self -sharpening technology ensures that the blades are enough sharp to trim the hair precisely every time. Not just this, but it is also a great travel partner being handy. 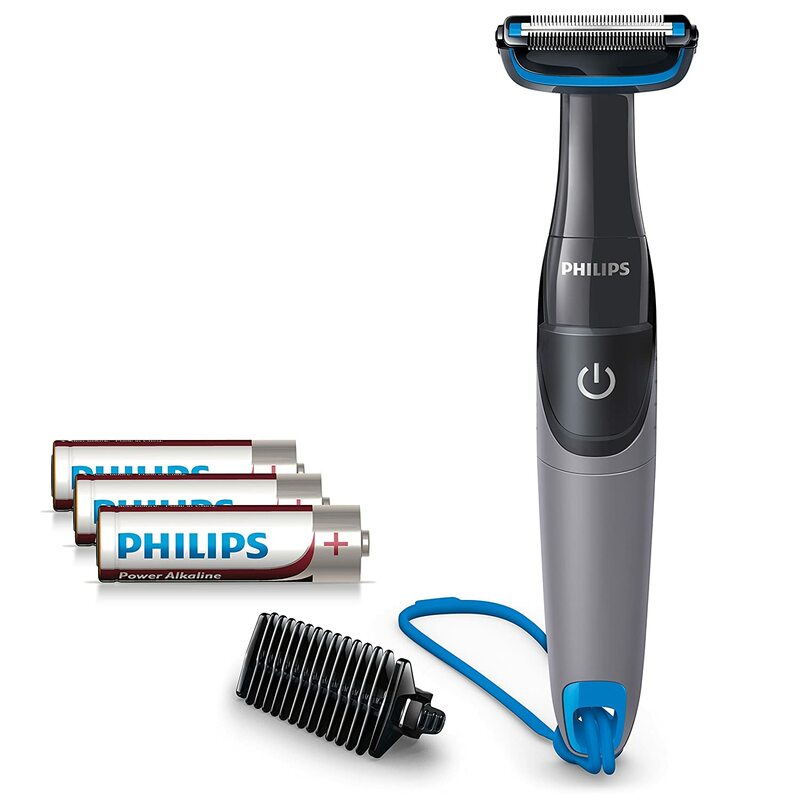 This Philips BG1025/15 Showerproof Body Groomer is a groomer for your all of the body areas, even for the sensitive ones. The unique Skin Protection System guards skin from blades. You can cut the hair in any direction you want by it’s bidirectional trimmer and comb feature. So you don’t have to be a PRO while using this groomer. The blades get sharp automatically by it’s self sharpening technology. So, there is no need of replacing the blades regularly. Ergonomic Design makes it more easy to hold it while bathing. This is 100 percent waterproof , can use it under shower and can hang in bath room with the help of the shower cord. It gets power from AA batteries, which goes around 2 months with one AA battery if using once per week.2 year’s manufacture’s warranty is a must with this product from the date of purchase. Ultimate Pro Body Groomer and Trimmer combined into 1 unit to shave and trim all areas of your body with precision and ease by Mangroomer is simply excellent. 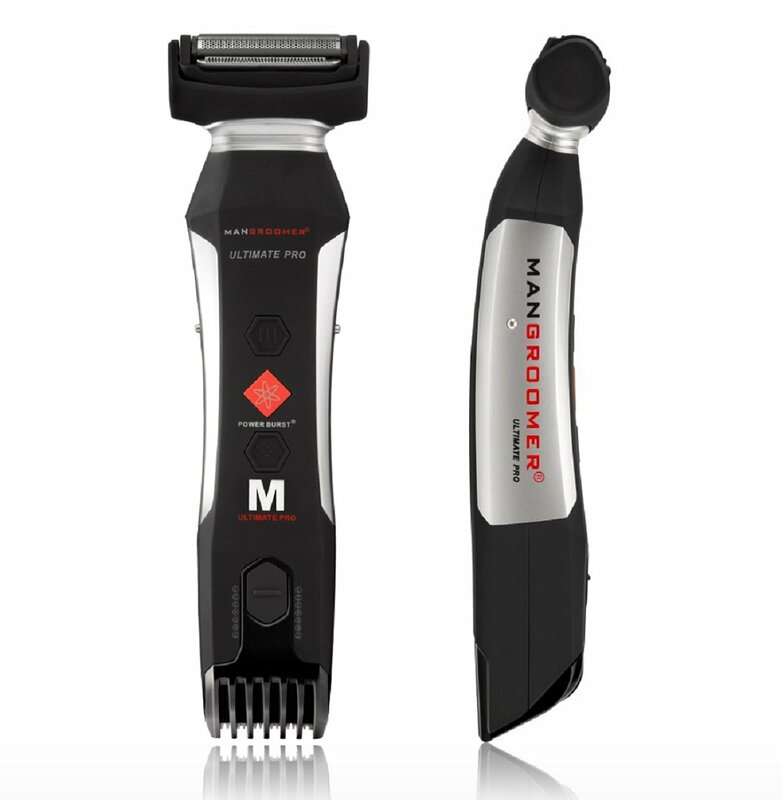 You have Power Burst buttom by which you can even shave and trim the extra thick hair of your body.Double sided trimmer helps you to trim in any direction you want. New Shock Absorber Multi-functional Flex Neck follows all contours of the body while shaving and achieves a perfectly smooth shave with no irritation in sensitive areas. It has 7 setting for detailed trimming all through the body. Foil Blade design cuts both long and short body hair effortlessly to achieve complete smoothness in one fluid motion. It is very easy to clean and it’s ergonomic design helps to hold easily even under shower.